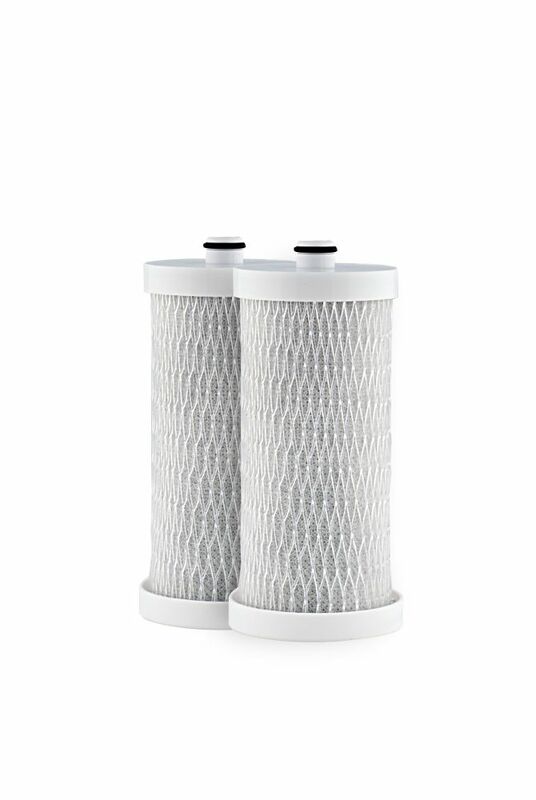 Fridge Filterz FFFD-311-2 cyst filter (Standard 42 & 53) 2 Pack replacement water filter is designed to fit selected Frigidaire* & Kenmore* refrigerators. This premium water filter is designed to remove sediment, Chlorine Taste and Odour as well as contaminants and heavy metals including Lead, Mercury, Lindane, 2-4-D, atrazine and benzene, to name a few, that may be present in your drinking water. This refrigerator filter replaces: Frigidaire* Filter 5303917752, RF200, RC200, RD101 - Kenmore* Filter 46-9906, 9906. The FFFD-311-2 is tested to meet NSF/ANSI Standard 42 & 53, Particulate Class I, to ensure that you are getting a SAFE, quality product. Fridge Filterz are manufactured to the highest quality standard, providing you and your family with clean, odour free ice and water without removing beneficial minerals and fluoride that may be present in your drinking water. Fits refrigerator models beginning with 253 or 970, which were produced before the 2001 energy standard. NSF Certified to Reduce the Most Contaminants. * based on NSF rated 6 month refrigerator filters flowing .50 gpm - .60 gpm. Reduces 66 contaminants including pharmaceuticals, metals, minerals, pesticides, cysts, industrial chemicals, Class I Particulates and Chlorine. * The contaminants or other substances removed or reduced by thiswater filter are not necessarily in all users' water. Replace every 6 months to ensure clean, safe drinking water. Frigidaire FFFD-311 Replacement Refrigerator Water & Ice Filter (2-Pack) Fridge Filterz FFFD-311-2 cyst filter (Standard 42 & 53) 2 Pack replacement water filter is designed to fit selected Frigidaire* & Kenmore* refrigerators. This premium water filter is designed to remove sediment, Chlorine Taste and Odour as well as contaminants and heavy metals including Lead, Mercury, Lindane, 2-4-D, atrazine and benzene, to name a few, that may be present in your drinking water. This refrigerator filter replaces: Frigidaire* Filter 5303917752, RF200, RC200, RD101 - Kenmore* Filter 46-9906, 9906. The FFFD-311-2 is tested to meet NSF/ANSI Standard 42 & 53, Particulate Class I, to ensure that you are getting a SAFE, quality product. Fridge Filterz are manufactured to the highest quality standard, providing you and your family with clean, odour free ice and water without removing beneficial minerals and fluoride that may be present in your drinking water. Fits refrigerator models beginning with 253 or 970, which were produced before the 2001 energy standard. Frigidaire FFFD-311 Replacement Refrigerator Water & Ice Filter (2-Pack) is rated 5.0 out of 5 by 2. Rated 5 out of 5 by Hipster Doofus from We got filters - big deal I'm glad that Home Depot had the filters available on-line as no one stocks them at the local stores. The product was as described and the delivery time was excellent. Rated 5 out of 5 by David from Excellent replacement filter Received the product two days after I ordered it online. It's a perfect replacement filter for my Frigidaire FRS22ZRH.